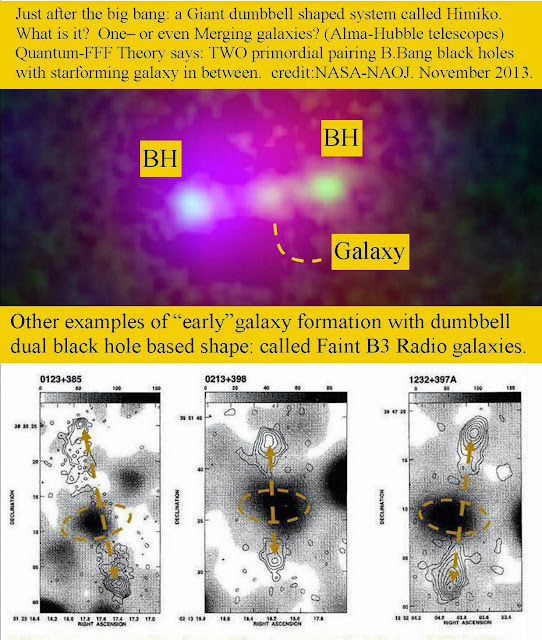 Not THREE primordial Galaxies Holes BUT ONE ( according to Quantum FFF Theory). 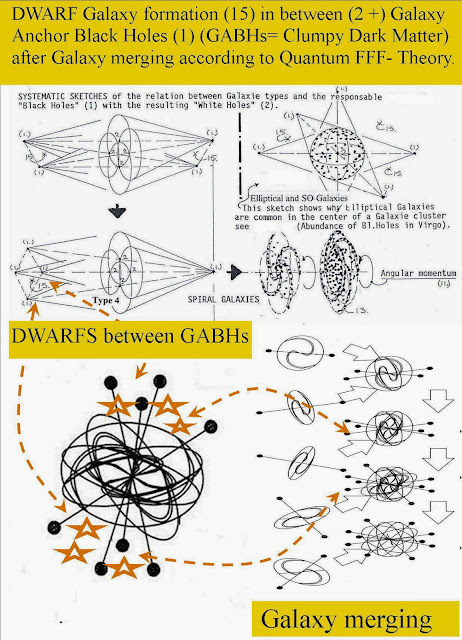 How GABHs Galaxy Anchor Black Holes are resposnible for the complexity of galaxies after merging of galaxies and adding GABHs!! more GABHs : more Complex SO Galaxy. GABHs all around: Elliptical Galaxy. Only the double rotating Fermions: here Electron and Positron are shown. The Higgs is supposed to be all around osillating along the Truncated Tetrahedron lattices. The Higgs particles ae supposed to be cut into photons which are constantly emitted by the Fermions, but are also the origin of the Fermion rotation!! 1: Dark Matter Black Holes do not emit Gravitons. 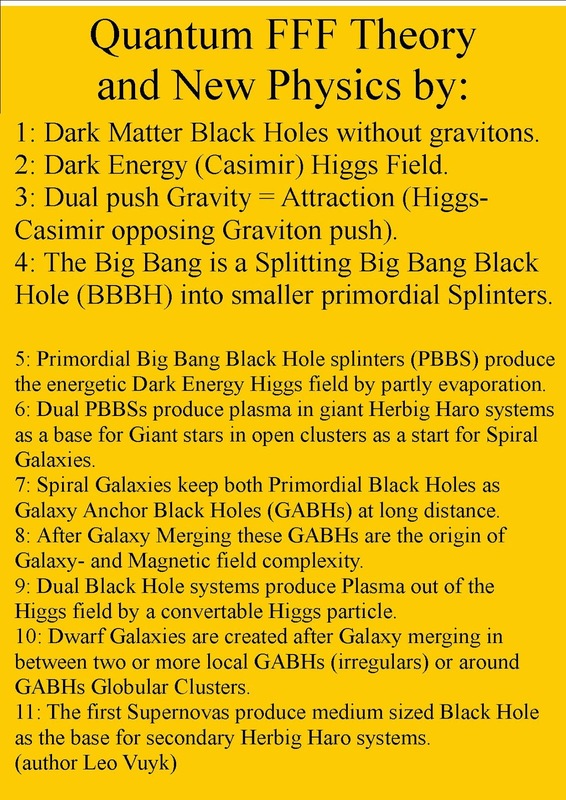 2: Dark Energy (Casimir) Higgs Field. 3: Dual repulsive Gravity = Attraction (Higgs-Casimir opposing Graviton push). 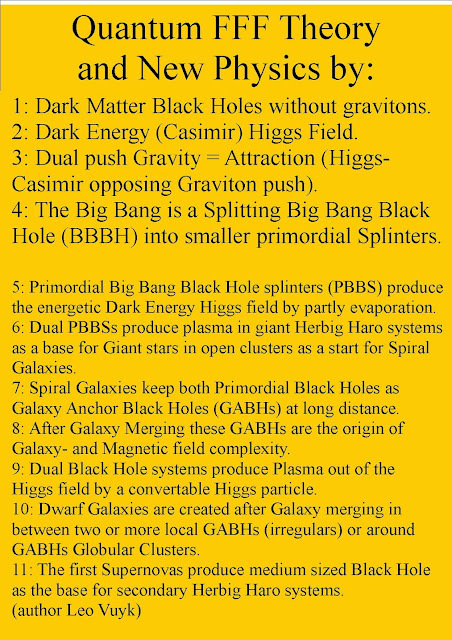 5: Primordial Big Bang Black Hole splinters (PBBS) produce the energetic Dark Energy Higgs field by partly evaporation. 6: Dual PBBSs produce plasma in giant Herbig Haro systems as a base for Giant stars in open clusters as a start for Spiral Galaxies. Galaxy Anchor Black Holes (GABHs) at long distance. Galaxy- and Magnetic field complexity. Higgs field by a convertable Higgs particle. between two or more local GABHs (irregulars) or around GABHs Globular Clusters. 11: The first Supernovas produce medium sized Black Hole as the base for secondary Herbig Haro systems.